This book tells a fascinating story of the Civil War through interviews with those who saw the terror and tragedy of the great conflict. If you are an American history buff, this book is a must. 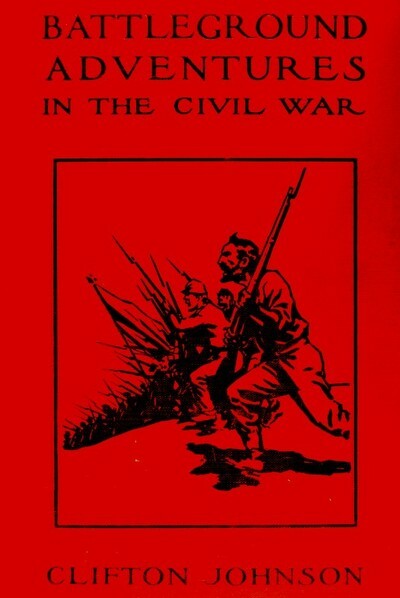 It was first published in 1915 and tells about people through first-person interviews. Read Battle Ground Adventures online for free. Dad had already gone when Bobby got up. This disappointed Bobby a little but then he remembered—this was the big day. Naturally Dad would get over to the project early. And at four o'clock— Bobby shivered deliciously at the thought of it. He ate his breakfast in silence with Mom across the table drinking a cup of coffee and looking at a fashion catalogue. He was glad she was occupied because he didn't want to talk; not today he didn't. Might spill something secret. Might even let out the big secret. That would be terrible. Of course, all things were secret at Buffalo Flats. So secret top scientists like Dad didn't even discuss them with wives like Mom. And wives like Mom never asked. So it was really something to sit there eating breakfast knowing that, today, Dad was going to rocket to the Moon. And with Mom not even knowing the Lunar project was in the works, so naturally not dreaming that he was going with Dad! The thrill was overpowering. Maybe they would have radio communication after they got there and he would call back and say, Hello, Mom! Guess where I am? On the moon with Dad! And Mom would say, Why, Bobby! Scaring me to death like this! I was looking all over for you. Sounding very angry but not being really angry after all. Because maybe Dad would cut in and say, Yeah, he's right here with me, dear. What do you think of this boy of ours? Bobby gulped the last of his cereal so he could go outside and wriggle for joy. As he got up from his chair, Mom said, "And what's your plan for today, young man? Davy Crockett or Buck Rogers?" Bobby had a quick thought—a sudden temptation. Why not give Mom a hint? Why he could even tell her and she still wouldn't know. Then later, after he was gone, she would remember back and say, That boy! When he tells you something he really means it. Bobby smiled and said, "I think I'll go to the moon today." Mom smiled too and went back to her fashions. "Well, see to it your fuel mixture is correct." "I'll check it. And Mom—I might not be home for lunch." "Well, mind your manners and say thank you when you leave." Out in the backyard, Bobby fussed around his space rocket a little: tightening a screw here—hammering in a nail there. Just until he could slip away without Mom noticing his direction. It wasn't a bad rocket at that, he thought. Six feet long with two seats and a keen instrument panel. But kid stuff of course. After he found the way in through the sewer he hadn't paid any more attention to his own ship. He could see Mom through the window, back in her book, so he went casually out through the back gate and turned left, kicking at pebbles as he sauntered along and trying to look as though he had no place to go. Had to be careful. Didn't want to bump into any of the other kids today, either. The way in through the sewer was at a place behind Laboratory B. There was a kind of an alley there that nobody ever walked through and then this round lid you could lift up and look under. And a ladder you could climb down. Bobby hadn't dared go down at first. But, after thinking about it overnight, his curiosity won out and he went back and ducked down into the lower level. He called it a sewer because of sewers being underground, but this place was clean and had bunches of wires strung in every direction and faint little lights you could see by. Bobby went further and further every trip he took, never telling anybody because you weren't supposed to talk about things at Buffalo Flats—not even to the other kids. Then he found the big drome where they were building the rocket. It was so sleek and beautiful and shiny that he just stared at it—up through the grating in the floor that was for air circulation or something. He didn't know it was the moon rocket at first. Not until he'd gone back several times to peek up at it and then one day two scientists came walking along right in front of his nose. One of them was Dad. Bobby almost called out but he caught himself and just listened to them talking. This was the first time his conscience bothered him about going underneath the drome. He thought about it a lot—whether it was the right thing to do. And while he was never able to still his conscience completely, he quieted down by saying he really wasn't doing any harm because he'd never told anybody what he saw. He learned the rocket was going to the moon by listening to Dad and the other scientists talk when they thought they were alone. And it was funny. Because even there, they spoke in low voices and didn't give too much away. He had known now for three days that at four o'clock the roof would open and the drome would be turned into a blast-pit and the rocket would shoot out through space to the moon. That was all he did know for sure. None of the men had said who was going on the first trip to the moon. Nothing had been said on that subject at all, but Bobby knew Dad would go. He would have to. After all, Dad was the second biggest scientist at Buffalo Flats. Second only to Schleimmer himself and Professor Schleimmer was very old and certainly wouldn't make the trip. That left Dad. Dad would just have to go in order to run the rocket. There probably wasn't anybody else smart enough in the whole place. 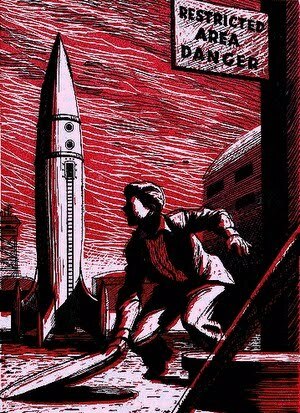 The idea of going himself had been born the previous day—when he found a larger grating in the floor near the rocket and realized if he was very careful he could climb out of the sewer and duck into the rocket when nobody was looking. Once inside he was pretty sure he'd find a place to hide until blast-off. All the men would probably be strapped in bunks but if he found a place he could wedge himself in he didn't think he'd get hurt. Then, halfway to the moon he would come out and find Dad and would he be surprised! At first, thinking about it, he'd been scared but after he realized how proud Dad and Mom would be, he made up his mind. Now, crouched beside the grating near the ship, he waited while two men—technicians in white overalls—walked by. One of them said, "Well, whatever happens, she'll make a big splash." "You said it. Hope the brains know what they're doing." That made Bobby mad. Who said Dad didn't know what he was doing? Dad was just about the smartest scientist in the world. After the two men left he waited a long time. He heard voices but no one came in sight. Taking a deep breath, he opened the grating and got out. It was only four steps to the open port of the rocket. There was a little ramp they'd used to roll things in and Bobby's feet touched it but lightly as he jumped into the ship. He found himself in some kind of a storeroom. It would be a good place to hide all right. It was full of aluminum barrels all the same size. He found a space between two rows and sat down and got his breath back. It was very quiet around him. Scary quiet. But he set his lips firmly. He was going to the moon with Dad. John Kendall was a little late that night. He kissed his wife and said, "Well, did you see the big sky rocket?" "How could I miss it, darling? Your supper is in the oven." "I could use a Martini first." While Myra fixed the drink John lay back in his easy chair and closed his eyes. "We'd hoped to stage a little ceremony at the launching but Washington said no." "The Eastern Coalition. It was a race. That was why it had to be so secret. Washington said, light the fuse and fire the thing." "No. Not between us at least. We fired an explosion rocket at the moon. It will hit in about an hour and telescopes will show a big purple spot when our explosives go off and throw dye all over the place." Myra handed him a dry Martini. "I see. Lots of fun no doubt but what's the purpose? Fourth of July on the moon?" "Oh, no. If the experiment is a success the next rocket will carry men instead of a bomb." Myra went to the kitchen to see about supper. John called, "Where's Bobby? In bed I suppose." Myra didn't hear and John set his drink down and moved toward the bedroom. Maybe he was still awake. Bobby rolled over. His eyes popped open. "Dad! I thought you went to—"
John Kendall sat down on the edge of the bed and tousled his son's hair. "No, son. It's the old terra firma for me. Did you see the rocket blast?" "Uh-huh. It was really something. It went to the moon, didn't it?" "That's right." Kendall smiled and thought. Try to keep a secret from the kids. It just can't be done. "How's your moon rocket coming along, son?" "Pretty good. Gee, Dad! As long as you didn't go, I'm glad I didn't go either." "You were planning to make the trip also?" "Uh-huh. 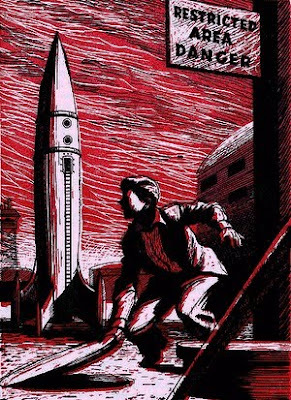 I got into the rocket and was all set but I got to thinking about Mom—how one of us should stay and take care of her in case anything happened." "Smart thinking, son. Now you get to sleep. I'll have a little time tomorrow. We'll play some ball." John Kendall smiled as he left the bedroom. Kids were wonderful! Give them a few old boards and a steering wheel and they could build a ship to fly to the moon. What a wonderful dream world they lived in! Too bad they had to grow out of it.